Come and join us for what has become, over the years, the annual gathering of international experts in the field of biosimilar medicines and a flagship event for an ever-growing number of stakeholders. 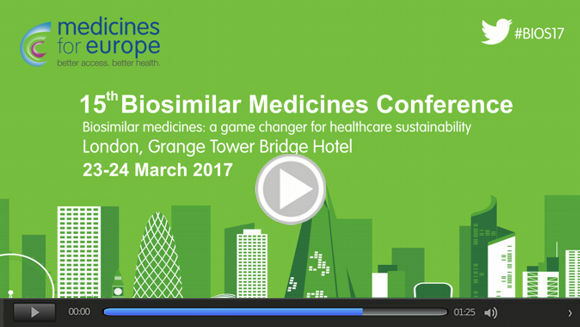 Following the successful event in 2016 when we celebrated the 10th anniversary of the launch of the first biosimilar medicine in the EU, the Biosimilar Medicines Group will organise its 2017 annual conference ‘Biosimilar Medicines: a game changer for healthcare sustainability’, in London on 23 & 24 March. Our 15th Biosimilar Medicines Conference will provide insight into the current state of play in the EU and stimulate debate, in a multi-stakeholder setting, on the important role of biosimilar medicines in the sustainability of healthcare systems. Beyond a comprehensive outlook of key European market access policies, a panel of renowned international regulators will outline the key recent developments in regulatory science and regulatory policy in the EU and other international jurisdictions. Particular emphasis will be placed on strengthening the link between regulators and medical communities as an essential basis for greater understanding and acceptance of biosimilar medicines.